Butterfly Host Plants are important when you create your butterfly garden to provide a site for the butterfly to lay eggs and also food source for the emerging caterpillar. Be prepared for heavy munching on your host plants! Because tiny caterpillars cannot travel far to find their own food, the female butterfly locates and lays her eggs on only the type of plant that the caterpillar can use as food. 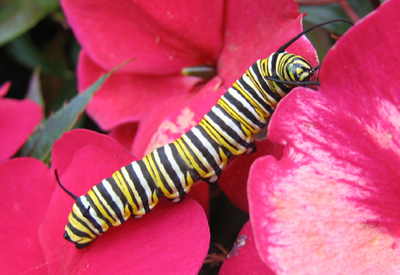 Most species of caterpillars are particular about the type of plants they can eat. If the egg was not placed on the correct plant, the caterpillar hatching from that egg will not survive. Many gardeners do not like to see plants in their gardens that have been chewed on by bugs. To avoid this, you may want to locate your butterfly host plants in areas that are not highly visible, but still a short distance from the butterfly nectar plants. If you do not provide host plants, you will have fewer butterflies. Specific Host Plants are Important for Each Kind of Caterpillar"
Many native trees and other plants found in and around our yards are host plants for caterpillars. There are a variety of plants that can be included in a butterfly garden that are excellent host plants. The Native Plants Database is a great resource for folks interested in selecting native plants for their yard.